Go through the 7 Rounds by taking one turn after another. In odd-numbered Rounds, you control the red Workers; in even-numbered Rounds, you control the blue Workers. The position of the First Player ship on the First Player tile will always tell you which Worker color you control (the top row of Round spaces is red; the bottom row is blue). In the Returning Home Phase, you may only return Workers from the Action board and Elders that you will be controlling next Round (i.e., return blue Workers in odd- numbered and red Workers in even-numbered Rounds). In the Work Phase, you may not use action spaces that are blocked by Workers placed in the previous Round (i.e., of the color you are not controlling). In the Fishing Phase, you must place fish on your red Shares even if you are controlling the blue Workers that Round. In the Work Phase, blue Workers may issue red Shares. The Imitation tile allows you to copy a blocked action space on the Action board (see also page 14). The color of the blocking Worker does not matter. As usual, the game ends after 7 Rounds. Score your display as explained on page 15. Your goal is to score as many Victory Points as possible. Good players score 30 to 40 Victory Points. 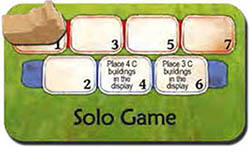 You can make things harder on yourself by turning the solo game First Player tile to the other side, showing three rows of Round spaces. In the advanced solo game, you will alternate controlling the red, blue, and yellow Workers. Consequently, in the Returning Home Phase, you will be leaving two colors of Workers on the Action board and Elders. Turn the Imitation tile to the 5-player game side (showing three action spaces). Use it as you would in 5-player games. Play three games one after another using the Building cards of one deck. At the end of the first two games, remove any Buildings that you have built during that game and set the Buildings left on the "A" and "B" Building supply boards aside. Add the "C" Buildings that you have not built to the unused "C" Buildings. In the second game, only use the "A" and "B" Buildings that have not been in play in your first game. For your third game, shuffle the set-aside cards and use those (i.e., you will only be using Buildings that you have not built in the previous two games). 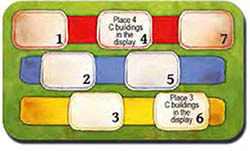 In the third game, it is possible that there are not enough "A" and "B" Buildings left to completely fill the supply boards. Also, in Round 6, there may be fewer than three "C" Buildings left to add to the display. In either case, you will be seeing fewer Buildings than normal. Your goal is to get a combined score of more than 100 Victory Points. The number of Victory Points that you score above 100 will define your rank, unless you already have a higher rank from a previous campaign. If you score at least 10 Victory Points below what your current rank represents, you lose one rank. (Your rank cannot drop below 0).